A good sound system can add a lot to any room or setup. There is a wide variety of ways you can do this. I have an Integra receiver and a small army of speakers on my setup and I love how punchy and big it sounds. There are also nice, small setups that can still bring a lot of life to any room. 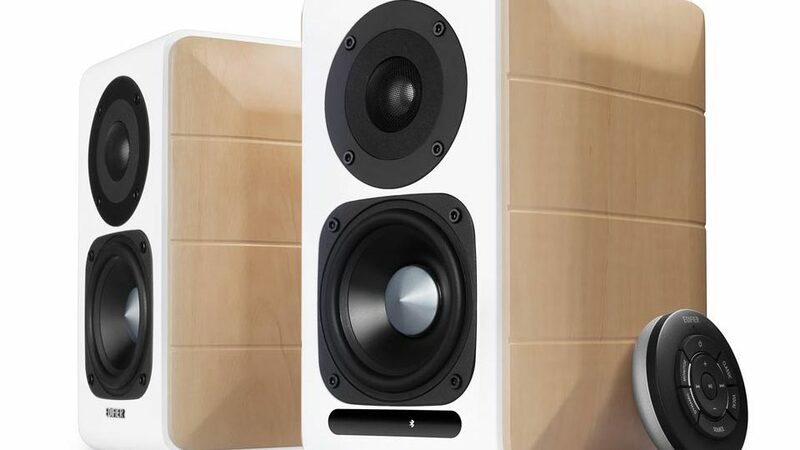 These Edifier S880DB speakers fall into the latter category. They have, what some may consider, a high price tag. But once you see (or hear) what they can do, it quickly becomes apparent that it’s worth it. Edifier created a strong set of speakers that have a lot of flexibility, don’t take up a lot of room, and work for many different occasions. They really give you a lot of bang for your buck so to speak. Especially when it comes to music. They are built to sound the best when playing lossless, or high fidelity, audio files. But they work well in many other ways too. Edifier was kind enough to loan us a pair to review and this review is in two different parts. I use my speakers for a lot of different things (gaming included) and I wasn’t about to go lightly on these either. First, I’m going to give a rundown of the speakers and some of their features. Then, after having put these things to the test in several different ways, I’m going to let you know how that all went. Let’s get started shall we? Let’s take a look at these things. The look of them are nice but definitely not something that will fit every style. They have a very light wood color on the sides and a white band around the front, back, top, and bottom. They look nice and modern but it’s going to be hard to match these up with anything unless you already have light-colored decor. This was pretty much the only thing I didn’t like about these. That is just my personal taste but it is something to consider. These speakers are quite heavy as well, especially the right speaker. They are very solid. There are also rubber bumpers on the bottom that work extremely well at preventing them from sliding around. Which is definitely a good thing as you wouldn’t want one of these to fall on someone or something. All in all, the build quality is very good. I appreciate things that are built well and this definitely passes that test. They are about 5 inches wide, 9 inches tall, and about 6 inches deep so you’ll be able to set them up most places around your home. The cords are fairly thick though so you’ll definitely need some extra space behind them. On the front we have the speakers. The 19mm tweeter and 94mm bass diaphragm really blast out the sound despite their small appearance. That’s mostly because of the what’s going on inside. There is a built-in amplifier, so you don’t have to have extra equipment to push these things. They are stand alone. You just have to plug them into the wall and this will push the 12 watt tweeter and the 32 watt bass speakers on its own. In other words, this thing will take pretty much anything you throw at it at many volume levels. On top of all that, the S880DB’s come with a built-in XMOS DAP (Digital Audio Processor). To put it simply this is great for playing lossless files which, as I will get to a little later in this review, is where S880DB’s are at their best. These are even certified for Hi-Res audio so there is that as well. In other words, these are some very good speakers and these internal features are what make the price more than worthwhile. On the back are your controls and inputs. Two RCA (one for PC and one for AUX), USB, Optical, and Coax give you plenty of options to connect. Included in the box are all the cables you could need in order to hook them up too, which is a definite bonus. And let’s not forget that the system also includes Bluetooth 4.1 so that you can connect wirelessly from your phone and many other devices. Unfortunately there isn’t any outputs to add to the system. Adding a sub woofer, for example, could have really brought the whole thing to life in a big way. But that’s not really what they are made for. These are bookshelf speakers and minimum clutter and less space is the name of the game. To the left you have a few control knobs that allow you to control the volume and make sound adjustments to treble and bass. The volume knob adjusts in small increments which is nice for those of us who like having things at the perfect volume. Although I have to say that even at the lowest volume, they are fairly loud. That is, of course, because of the built-in amp. Also included in the kit is a palm sized round remote that you can use in various ways including changing the source, volume, and controlling the songs. And it gives you a few options to change the EQ presets for sound. The four presets are Monitor, Dynamic, Vocal, and Classic. Dynamic is the richest sounding setting with a lot of, uh, dynamic sound. I spent most of my time on this setting although I tried all four on everything. Dynamic is the one I always came back to. The remote itself is pretty sturdy and feels well made. I think it’s a very convenient addition to the set, especially considering the physical controls are on the back of the right speaker. That could be inconvenient to access on a regular basis, depending on your setup. All in all the remote is very nice and I like the fact that it doesn’t feel cheap at all. Hopefully, at this point, I have given you enough information to give you a good idea of what the Edifier S880DB speakers have to offer. At $300, these are not a light investment. But you are getting some excellent hi-fi speakers for your money. This set is a really great way to get into the world of high quality audio. The built-in amp and DAP alone are worth the money. You could definitely spend a lot more on a bigger system with these same features. The looks are a little to be desired for me personally. I’m not a fan light colored things. Most of my decor is darker and these speakers stood out like a sore thumb. But that is just my personal opinion. I know there are a lot of people that like the look and that’s fine. As far as that goes, these really do look good. Just not my taste. Their smaller size also makes them very flexible in their use. It’s not a huge deal to move these from room to another. Although, you may not have to with these. The sound carries pretty far, so leaving them in one part of the house would still work as you can hear them all through the house quite clearly. The general sound of these speakers are that they are very clear and have great quality. The only thing I missed was the big bass that I’m used on my own system. Again, that’s more of a personal thing for me. I like having that big bass along with the clearness. I always try to either have a sub woofer with my setups so. It’s just what I’m used to. That doesn’t mean that the sound isn’t good though. These speakers are meant for high fidelity audio which means everything is going to sound really good. And at this price point you are really getting a treat in that respect. With that said, let’s put these speakers to the test shall we? One of the first things I tried was the Bluetooth. Having a set of speakers that you can connect to wireless is a really convenient way to listen to music while you are moving around the house, having a party, etc. Connecting with Bluetooth was a pretty straightforward process that worked mostly fine on two different kinds of phones. I couldn’t control volume on my phone but it wasn’t a big deal. Experiences are going to vary. But, I tried this in several different ways, switching between preset sounds for all of them. The first phone was my own, a Samsung. I connected and turned on my music player of choice, Pandora. I threw on the Thumbs Up playlist and went through several genres to try things out. These songs are what popped up randomly. Overall sound quality was good and clear. Gary Jules – “Mad World”: Piano and vocals sounded really good. The cello parts of the song were a bit hard to hear though. Clint Mansell & Kronos Quartet – “Summer Overture”: Excellent highs and mids. The Prodigy – “Climbatize”: Good mid bass and highs. One of the few times I missed some of the deeper bass though. Slipknot – “The Devil In I”: A band with a lot of percussion and it sounded pretty awesome. Gustavo Santaolalla – “The Last of Us” – As the theme for The Last of Us, most of you probably recognize this. Haunting and beautiful. I actually noticed a little more instruments I hadn’t noticed before on this one. Gojira – “Stranded”: Bass was light but everything was still pretty clear. Next my wife hooked up her phone (also an iPhone) and used YouTube to try out a song. YouTube tends to have a bit of a muddy sound to it. Especially when playing music videos. She played Florence and the Machine – “Big God” and it sounded pretty good despite being on YouTube. Next I hooked the speakers to my PlayStation 4 using an optical cord. It was time for some gaming. I tried a few different genres to see how well they worked and they all sounded really good. The S880DB speakers have good range and reach. Even though there are only the two speakers there was a little bit of surround sound going on. On top of that I could hear all the different sounds very clearly. Strange Brigrade – A 3rd person shooting game that takes place in the 30’s seemed like a good place to start. One of the first things I noticed was the clarity and impact of gunshot sounds. The game is pretty noisy and can definitely get a little hectic. I got a good idea of where things were based on just the sounds so it helped in that regard. Chasm – A sidescrolling action-platformer that is blatantly influenced by Symphony of the Night was my next game. Sounds were nice and clear and you could hear everything very well. Hitting enemies with weapons was all the more satisfying. The cool soundtrack also sounded really good. No Man’s Sky – One of my favorite pastimes is exploring planets and space in No Man’s Sky. Since the game is set in a sci-fi setting, the sounds are already very smooth and futuristic. The S880DB definitely helped improve how well it sounded. I also could hear every little environmental sound and the moody music quite well. Resident Evil 7 – This game pretty freaky as it is. It’s one of the few games that I physically tense up when something is chasing me. Not sure if it’s the first person view or what but it sure gets the adrenaline pumping. These speakers didn’t make it any better for me. Hearing everything so clearly makes it scarier. Which is the point I suppose. I didn’t try out a lot of movies but there is always one that I fall back on for testing things out. And that is The Dark Knight. For one it’s great for testing the black levels on your new tv. And two, the sound design is excellent. I watched the first part where they rob the bank and it sounded so good. Everything sounded crystal clear (are you noticing a trend yet?) and impactful. However, this is one of the few times that I missed having that booming bass that comes with a bigger system. Movies especially benefit from that added bass. That’s not to say that it wasn’t there, but it does not have that big sound that you might be used to from a surround sound or a theater. You have to keep in mind that these are not made for that kind of big sound. Other than that, the sound was great. These speakers are still going to be work well for watching movies on. I watched one other thing before I disconnected from my PS4 and that was an episode of The Good Doctor on Hulu. This, I really enjoyed. The voices were super clear even at lower volumes. Which is definitely something you want when watching a show, drama or otherwise. Again, you won’t have the big sound but lots of clarity. In this case I did not miss the big bass. After playing in virtual worlds and watching filmed ones, I decided to hook the speakers up to the family PC and try out a couple computer games. I’m not a huge computer gamer but I have been known to put more than a few hours into certain games. This time I hooked the speakers up via the USB. This is where these things really start to shine. Remember the DAP that I mentioned earlier? This connection is what these speakers are made for. The processor takes the audio info and basically relays it the way it was meant to be heard. And just after playing a couple games, it already made a very notable difference. Minecraft – I spent a little while in the low res world of Minecraft. The sounds were as crunchy and low-fi as you might expect but somehow it still sounded better with these speakers. I built a few things with various blocks and fought a few more monsters and it all sounded crystal clear and immersive. Subnautica – I wanted to pick a moody game with a lot of ambiance and this is the first one that popped in my mind. The sound design is one of the high points of Subnautica. Mellow ambient music and sounds from the deep ocean creatures create an immersion that you don’t see very often. Playing through the S880DB speakers was a real treat and added even more to the immersion. I like to think I have a pretty nice system set up right. Music sounds awesome through it. But it’s not quite setup for playing true hi-fi sound. It’s missing some of the tech to be true hi-fi. This is where the Edifier S880DB speakers really shine. Quite frankly, this is what they were built for. Hooking these up to a computer via USB takes full advantage of what was put inside. This alone is worth the price tag and makes these a great entry into hi-fi sound. I have a handful of flac files to try out, which are lossless audio files. These songs don’t lose any quality in the compression process. In other words, you are hearing how the music is originally supposed to sound. It’s an experience every music aficionado should try. The difference might seem small but it makes listening quite stimulating. Agnes Obel – Agnes has a very haunting and melancholy style with a lot of piano and cello along with her vocals. In other words her music is beautiful and emotional in a classic sense. Playing through these speakers was excellent, verging on divine. Florence and the Machine – Great music and amazing vocals make for some amazing listening on most any device. But Florence sounds that much better and epic when listening through these speakers. A lot of their songs are fairly complex in that there are plenty of instruments. I could hear each one so clearly. Gojira – A metal band that hails from France, Gojira does some interesting things with how they piece together their music. Their music not just heavy in general sound but some of their stuff is literally bass heavy. Unlike when I listened to them on Bluetooth earlier, the bass was a lot more prominent. I could hear each instrument all working together and made the sometimes strange changes this band is known for, all the more satisfying. Rammstein – Of course, I couldn’t go without trying out my favorite band of all time. This industrial/metal German band lends itself well to these speakers. Lots of low to mid range with a plenty of head banging drum kicking. I get chills listening to these guys on a regular basis let alone sounding this crystal clear. I know it’s been a long journey to get here but I like to put things through their paces when I can. Edifier has made some speakers that are an excellent way to get into hi-fi listening without breaking the bank. You really are getting some good tech for a decent price even if it’s not quite obvious at first glance. There are a lot of options on how you want to use these but if you want to get the full experience be sure to hook these bad boys up to your computer and pump some lossless files through them. Or get a good record player, which I was unfortunately unable to try out. Besides that, the Edifier S880DB worked really well for gaming on both console and PC and I definitely wouldn’t mind watching TV with these either. Add in the Bluetooth and you have a system that can be used for just about every occasion and sound great. There were only a couple of cons for me but they were more of a matter of personal opinion. I wasn’t overly fond of the look as the light coloring did not match any of my decor. And these speakers fell a little short if you are looking for big sound like yIt sounds great but you won’t be getting that booming bass. Basically, if you are looking for a set of bookshelf speakers that you can easily connect to and play music on or are in need of a high quality speaker setup for your computer, you can’t go wrong with the Edifier S880DB speakers.